The California Salmon (Cal Salmon) is a classic; if you are a class IV-V boater living in Oregon, Idaho, or Northern California and you haven't run this river, you need to go there... now. The Salmon has a long, colorful history of boating that stretches back to the very early days of kayaking, with a long season, easy access, and miles of great rapids. Optimal flows range between 2000-4000 cfs for this river (though it starts to stomp once it gets over 4000 cfs..) so this is generally a big water boating trip with stompy holes and pushy hydraulics in every major rapid. (The photos on this page were taken in the 3,300-3,500 cfs range.) The water is crystal clear, the canyon feels extremely remote, and all the rapids have clean, reasonable lines with no mandatory portages. The canyon the Salmon flows through is as impressive as the river, with walls towering hundreds of feet overhead and thick california greenery sprouting from every vantage point. The scenery matches the rapids in terms of pure quality! The majority of the rapids on the Salmon are class III to IV+, with one towering class V boulder garden known as 'Freight Train'. Freight Train is portagable and scoutable down the right side, but it has a rapid known as 'Big Joe' (aka 'Last Chance') about 100 yards above it that must be run in control.. people have taken swims in the hole at Big Joe and and ended up swimming down through Freight Train, so be very careful as you approach this drop. (For some great overhead shots of Freight Train and Big Joe/Last Chance, check out Mike Haley's trip report on the Cal Salmon at a low summer flow of 500 cfs). If you want to play it safe or you're having One Of Those Days, Big Joe can be scouted/portaged on the left pretty easily. 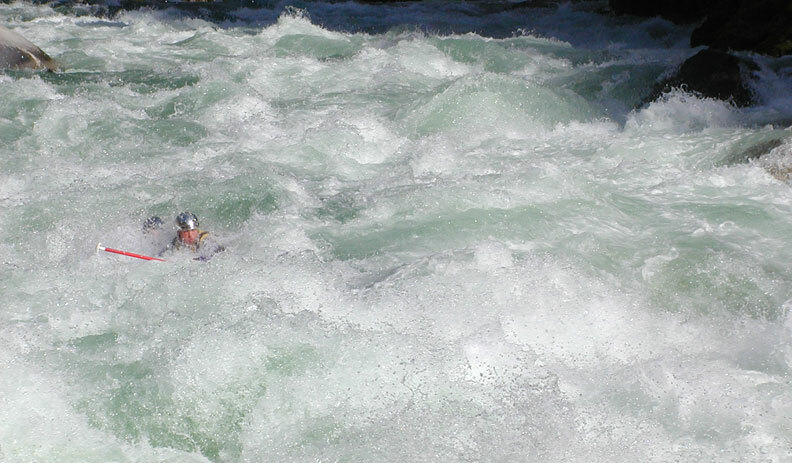 It should be noted that you have to run a few of the rapids on this river due the nature of the canyon walls. The biggest 'must-run' rapid on the Cal is a class IV drop known as 'Gaping Maw' and is pictured at the end of this report. 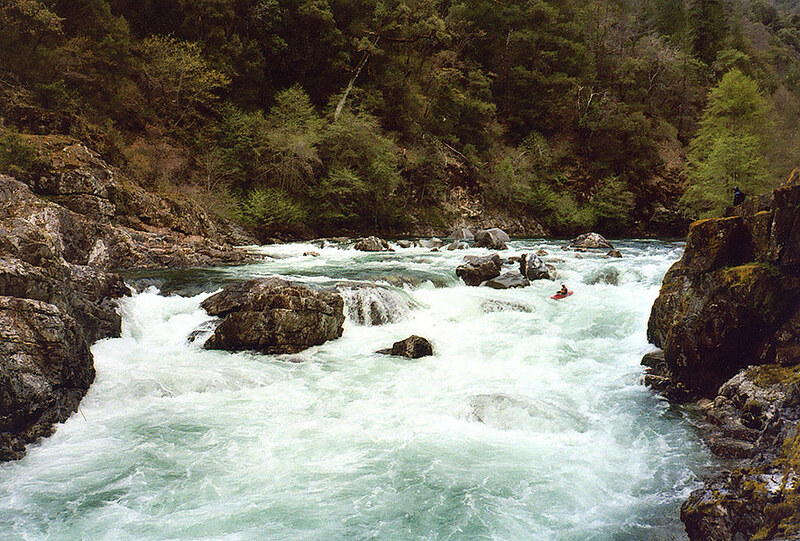 I ran the Cal Salmon for the first time on our spring 2003 boating vacation. Pete Giordano, Josh Knapp and myself had just finished boating for two weeks, and we ran the Cal at 3,300 cfs. It was big and pushy, and we all had a great time. The photos in this report are actually a mix of those I shot on our spring trip, and those my from Pete Giordano's return training trip in the spring of 2004 for Blue Sky Rafting, his rafting company. 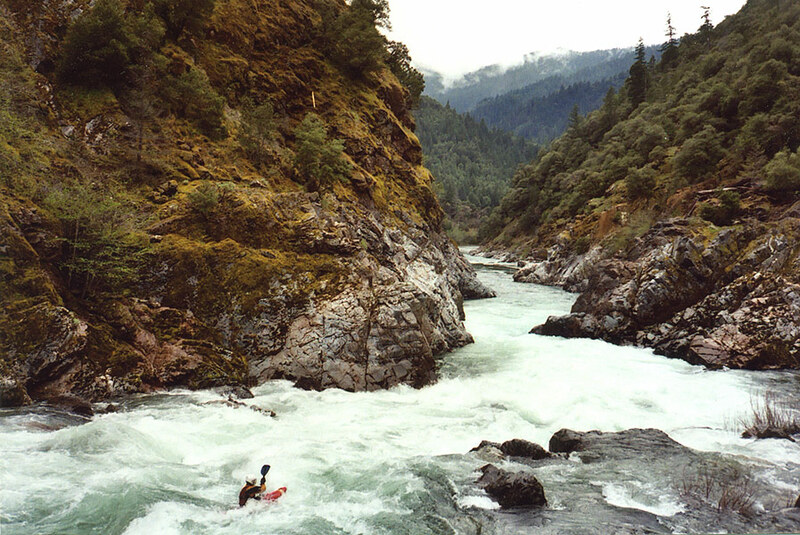 ( Pete's company does Cal Salmon commercial rafting trips in the spring ). The first time I ran the Cal-Salmon I fell in love. It was the end of my first kayaking trip to California and the Cal-Salmon was the last of many incredible rivers we did that trip. Now I was back the following year scouting 'Freight Train' and wondering why I was actually considering running this monster of a rapid. A mixed group of kayakers and rafters had come down to the Cal-Salmon area to do some training for our first year of commercial rafting in the area. We ran the SF Salmon the day before and thought that would be the adrenaline rush of the trip but looking at the high water level at Bloomer Falls I was beginning to think this trip on the Cal-Salmon might provide a fair amount of adrenaline as well (The gauge was 3,500 cfs and rising when we were on the river and these photos were taken). Ryan and I were kayaking ahead of the raft in order to get pictures and video. We ran Bloomer Falls down the left side (the kayak line which avoids the huge hole) and got out to take photos of the raft crew coming down. As I was scrambling down the rocks to set up for a good picture angle I saw the raft come tearing around the corner and enter Bloomer. They squared up on the middle of the falls, (the hero line) and dropped in. Well, what had been good line at medium flows a few days before turned out to be a little bit tougher at this higher level. The raft cleared the first hole when they hit the beefy bottom hole they immediately got annihilated. On impact the three guides were immediately ejected from the raft like little multi-colored bottle rockets but this probably kept the raft from flipping. Ryan and I watched as the paddlers were able to get back into the raft minus a couple paddles which quickly disappeared around the corner..
Our raft crews swims out of the bottom hole at Bloomer Falls after running the 'Hero Line' right down the middle..
As Ryan and I quickly gave chase to the paddles I found myself sneaking almost everything because I couldn’t tell the difference between a big friendly wave and a big ugly hole. Ryan, who used to work on the Gauley, quickly took the role of probe and I followed his lines until we caught up with the 2 paddles about a ½ mile below Bloomer Falls. The rafters were now pretty cautious as we made our way downriver but we were quickly developing a nice rhythm through mostly big waves and forgiving holes. Despite scouting the next big drop, I missed the ferry over to the right side of the river and promptly got dynamically flipped and pushed deep into a seam below the drop. I rolled up and made it to shore where Ryan was laughing about how I had just disappeared below the drop. At least now I was warmed up and focused. The next major drop is Cascade, a wonderful rapid with three great lines to choose from. I chose the straightforward left line while Ryan successfully boofed the middle ledge. Seeking redemption after dumping almost everyone on the last run down Cascade, the rafters chose the bold run down the waterfall on the river-right. They greased it this time. Josh Knapp, dwarfed by Cascade. The center boof and far river-right 'waterfall' lines go as well. After a few more fun rapids we were now scouting Freight Train. After a little thought Ryan decided to give it a go and promptly rolled at the top of the rapid and then pinballed his way down the big waves and holes but emerged intact at the bottom. Josh Knapp runs the main line at Freight Train. There is a very large hole at the bottom of this drop, as the raft crew discovered.. There was some talk about lining the raft down the rapid but after some discussion they decided to give it a go, despite the higher level. The big risk for them was flipping near the top of the rapid and having to swim down through the big stuff at the bottom. 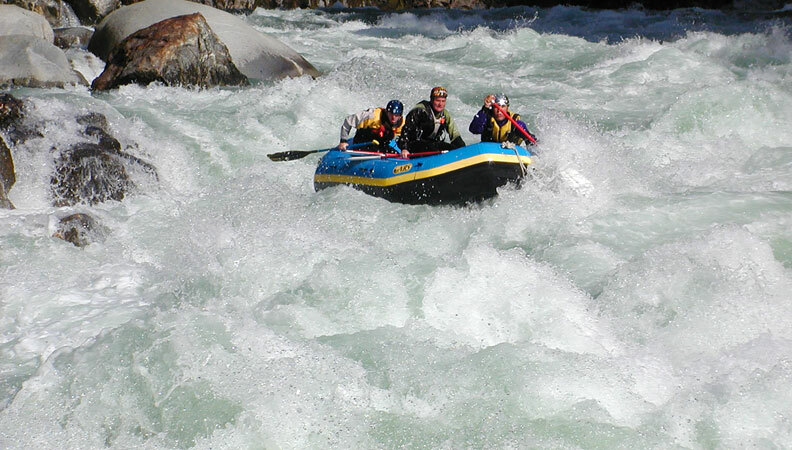 When they hit the current at the top of the rapid they immediately got pushed too far right and bashed their way down through some big holes before getting to the main current. They went up one big wave sideways and we thought they were done but they managed to settle the raft and set up for the huge hit at the bottom (pictured below). Half in control they managed to keep the raft upright and into the pool below. Photo 1: "Ohhh S--T!!!!" Paul and the raft crew gets funnelled down into the HUGE bottom hole at Freight Train..
Now it was my turn…I told Ryan I was probably going to walk but he encouraged me to give it another look. So there I am walking back to my boat after looking at the entrance and giving Ryan a thumbs up and wondering “Why am I running this thing?” After almost dying on a couple big water runs I’ve realized that big water is not my forte. Despite this, I seem to be going through the motions of getting into my boat, attaching my sprayskirt, and paddling to the top of the eddy. I feel completely detached from the moment as I pull out into the current and begin my run. I run far left to avoid the holes that gave Ryan and the raft trouble but still manage to get surfed for a moment before getting straightened out. The waves are HUGE but I’m just focused on getting to the main hole upright. I skirt the two big waves halfway through the rapid and realize that I might be able to miss the big hole if I paddle hard to the right. Unfortunately once I get to the right a big curling wave picks me up and moves me right back into the middle of the big hole. Tuck, get spun, stay upright, brace, brace, quick roll and I’m headed through the exit hole backwards but still moving downstream. Finally in the pool below and I can’t even whoop with joy because I’m breathing so hard.. The rest of the run has some other big rapids but it is all easy compared to Freight Train. Relief, joy, and satisfaction are mixed with some beer toasts at the take-out as I realize just how special this place is and how lucky I am to be here. I’m already looking forward to my next visit. 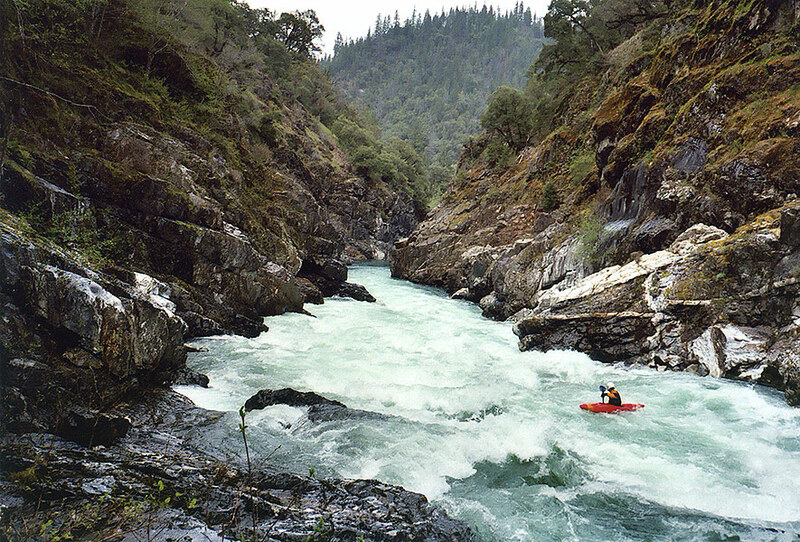 There are many other class III-IV rapids on the Cal Salmon, some of which have names and some which don't. One of the other big class IV rapids is known as 'Gaping Maw' because of the large holes scattered liberally throughout the drop..
Josh Knapp lines up on the largest must-run rapid on the Cal Salmon, a class IV drop known locally as 'Gaping Maw'. This rapid features a large hole on the center-left side of the river about halfway down, you can just see the hump forming the hole in the photo below if you look very closely.. 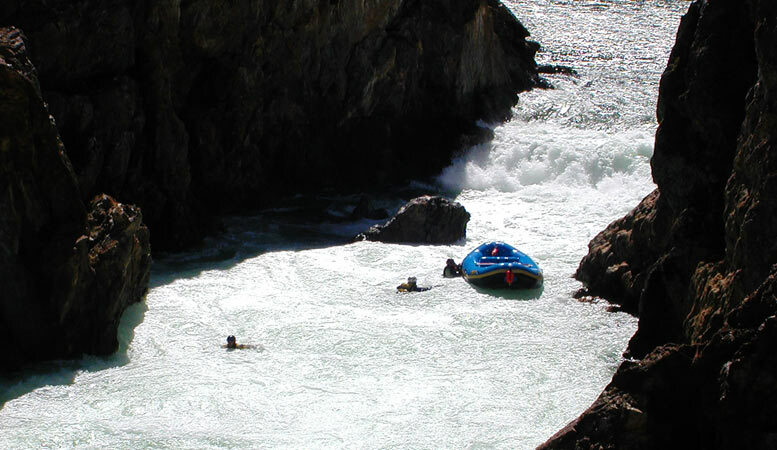 FLOWS AND BETA: For more info, pick up the Stanley / Holbeck guidebook, "The Best Whitewater in California." The Cal Salmon drainage is located directly south and slightly east of the popular Smith River drainage in Northern California. 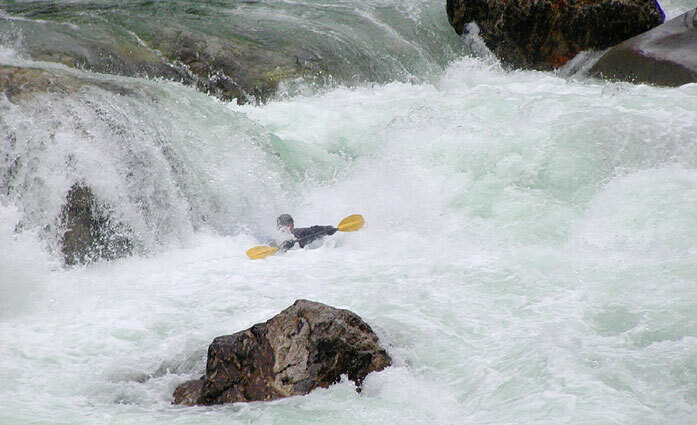 This is an excellent spring/early summer trip, with lots of other quality whitewater within easy driving distance including the South Fork Salmon (IV+), The Scott River (IV to V-), The North Fork Salmon (III-IV). The Cal Salmon has an internet gauge: The Salmon at Somes Bar. The photos on this page were taken with the Somes Bar gauge between 3,300 cfs and stable (photos of Josh) and 3,500 and rising (photos of the rafts and Ryan). Camping: Are you kidding? There are tons of great quality free camping spots in the Salmon drainage (especially along the South Fork). We have never had any trouble finding great spots down there.